There are many ways individuals classify themselves based on their views. Often people attach an identity to their views. Maybe they claim to be a “clean eater”. Or a “flexible dieter”. Or maybe it’s as simple as “keto” or “vegan”. Regardless, these classifications are used to tell us the person holds a certain set of views/beliefs. But how attached to them they are may indicate something more important… what type of thinker they are. Consider a hypothetical scenario in which you find yourself in a debate with three people with deeply held nutrition (or other) views. And not only are these views different to your own, but the exact opposite of them. Before potentially finding oneself in the kind of heated exchange that typically races to a sweaty stalemate, consider simply asking them what would it take to get them to change their mind about their views? Person 1 says something that equates to a postition of: “well, if I was presented with sufficient evidence then I would be willing to genuinely entertain the possibility that I am currently incorrect in my views and will consider updating my opinions about how accurately my ideas reflect our known reality”. In such a case then congratulations! You are having a chat with someone thinking like a scientist (or possibly Spock). Person 2 says something along the lines of “nothing would change my views because I know they are true and anyone who doesn’t believe the same is wrong”. This person is not thinking like a scientist. You are engaged with someone who is not there to exchange information and learn, but instead is there to defend their deeply held beliefs no matter what. Person 3 does not answer your question at all but actually gets so offended they flee to a “safe space”. This safe space can be a literal one in that they actually leave the conversation and likely return to their ideological echo chamber, or it can be a metaphorical one in which they slap a label or insult on you in order to discredit your point of view giving themselves a safe space by creating an excuse not to engage in discourse. Person 1 used Scientific Thinking. Person 2 used what I call Believer Thinking. Person 3 used what I call Victim Thinking. Now let’s reverse the question: what would it take YOU to change YOUR views? Furthermore, how did you actually end up with those views in the first place? Are you certain that your views are correct? (certain is defined as: “having or showing complete conviction about something.”) Are you intellectually honest? If so, do you think it is possible to actually be “certain”? Now, you may be wondering what does all this have to do with science? Well I would argue that the essence of science lies in the concept of certainty itself. True scientific thinking necessitates, at minimum, the acknowledgement that uncertainty actually exists, and at best the development of a comfort with it. This sense of comfort with the uncertain appears to go against our seemingly inherent inclinations toward its inverse. This is likely one of the main reasons as to why thinking like a scientist is such a difficult thing for us as individuals to actually do. It’s worth noting that scientific thinking can be applied to any field or aspect in life. And can be a huge advantage in our lives once cultivated. Are you “as” or “has”? True scientific thinking involves not identifying as your views, but instead identifying as someone that has views. The difference between ‘as’ and ‘has’ may seem initially subtle, but when you break it down the implications are quite enormous. When you identify as your views, you are locked into a specific thought pattern or belief system as the views and your own sense of self are intertwined as one and the same entity. When you identify as your views, you are shackling yourself to a fixed point locked into an ideology. When you identify as the thing that has views, however, you are now open to those views being swapped out in light of evidence. When you identify as the thing that has views, you are valuing the process of how you come to your views as more important than the content of the views themselves. Science is not about your views; science is about how you come to your views. In other words, how you think is far more important than what you think. With scientific thinking, you are essentially humbly acknowledging that you are unable to know everything there is to know whilst still striving to make the best decisions possible using available evidence. And given the inherent uncertainty that manifests as a result of the complexity of the Universe; you realize all you are ever doing is making best guess decisions. You are not chaining yourself to set views but instead are embracing the chaos of the infinite unknown with open arms because you have a way of thinking – Science – that offers a decision making process to navigate its uncertainty. 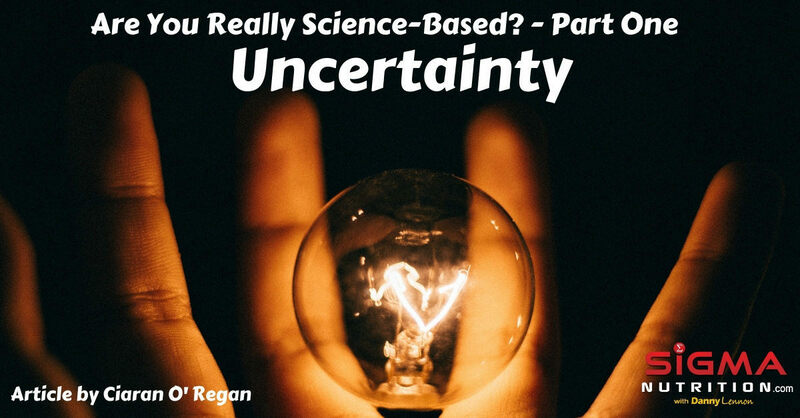 In part 2 of this series we will discuss why the only certainty in science should be to remain uncertain.